Ch. NIMS, « The Eastern Temple at Karnak », dans G. Haeny (éd. ), Aufsätze zum 70. Geburtstag von Herbert Ricke, BÄBA 12, 1971, p. 107-111 2 citation(s). Ch.  NIMS, « Tuthmosis III’s benefactions to Amon », dans Studies in Honor of John A. Wilson, SAOC 35, 1969, p. 69-74 1 citation(s). Ch. NIMS, « The Date of the Dishonoring of Hatshepsut », ZÄS 93, 1966, p. 97-100 2 citation(s). Ch. NIMS, W. SWAAN, La Thèbes des Pharaons, Paris, 1965 3 citation(s). Ch. NIMS, W. SWAAN, Thebes of the Pharaohs: Pattern for Every City, New York, 1965 1 citation(s). Ch. NIMS, « Popular Religion in Ancient Egyptian Temples », dans D. Sinor (éd. ), Proceedings of the Twenty-Third International Congress of Orientalists, Cambridge 21st-28th August, 1954, Londres, 1956, p. 79-80 1 citation(s). Ch. NIMS, « Places about Thebes », JNES 14, 1955, p. 110-123 10 citation(s). 4 978 405 visites - 635 visite(s) aujourd’hui - 6 connecte(s).